Every year, many in our community dedicate the last 2 days of the SciPy conference to participate in the development of open-source projects to push our ecosystem forward. Sprints are an informal part of the conference, where all are welcome to exchange ideas, hack on exciting projects, and create lasting connections. What will you do as an attendee? There are a variety of ways to contribute during the sprints session including testing code, fixing bugs, adding new features, and improving documentation. You could also contribute to an entirely brand new project that our ecosystem is missing. 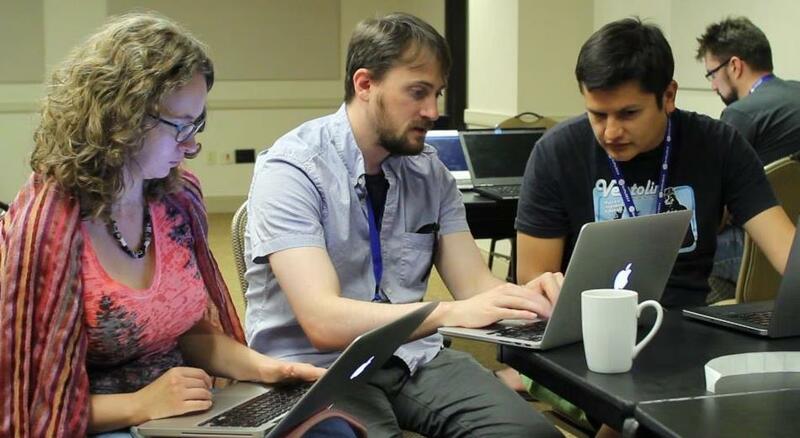 One of the best parts about the sprints is that you might also have the opportunity to work with authors and core contributors of your favorite open source packages, as well as, the opportunity to work alongside other developers who are just as excited as you are to make the SciPy community even better. What are the benefits of attending a sprint? Make open source Python better! Code alongside package authors/contributors, while learning from them. Become a power user of a core package by gaining a deeper understanding of its inner workings. Get to know other SciPy community members at the Sprints dinner. Yes! Sprints are open to everyone no matter what your programming level of experience! Sprints are a great way to add your contribution to your favorite Python libraries and packages. Thanks to the generosity of our sponsors, sprints are free of charge for all participants, including the Sprints dinner on Saturday evening. If you aren't sure about how you can contribute to a project, it's not a problem! We'll get you up to speed at the Sprints tutorial session on Saturday morning. The tutorial lasts about 2 hours and is dedicated to new sprinters. What projects do people usually sprint on? Don’t see your project or one that you think needs help? Your package is open source. Your package is general enough to be useful to others in the SciPy community. Your package **or package idea** is mature enough to receive external contributions (code, documentation, ideas). You have a strong enough grasp about your package to lead newcomers. If you can answer "Yes" to all these questions, you shouldn’t hesitate to run your sprint. On Saturday morning, each sprint leader is given 2 to 3 minutes to pitch his/her package/idea to attendees in order to rally the troops. How to “get ready”? You have never run a sprint before? Don’t worry! We will provide guidance, and we will help to be successful. Don’t wait: register your sprint on the SciPy sprint form now! The SciPy 2018 Sprint and Financial Aid committees would like like to encourage more Scientific Python leaders to lead sprints at the conference and grow our foundations and the contributor base! We have funds dedicated for financial aid to help sprint leaders. Financial aid will cover two nights of lodging to enable sprint leaders to share their knowledge of a package central to our community and pedagogical skills to help make sprints more accessible and grow the contributor pool. To apply, please complete the form here. The application will remain open until Friday, May 25, 2018. Recipients will be notified on a rolling basis. Mar 16, 2018: Sprint call for submissions open.